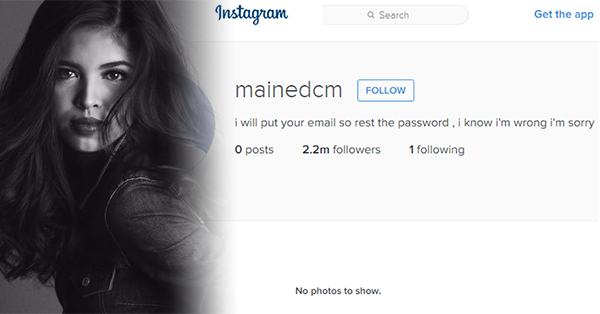 The Instagram account of Maine Mendoza, more popularly known as Yaya Dub of the hit love team AlDub, got hacked. Read more to find out why. The profile picture and all other photos on the timeline of the online sensation-turned television star were deleted on Tuesday night. From public, the hacker also switched Maine's account into private. Alden Richards, her onscreen partner, was the one who revealed that her account was compromised. The actor likewise tracked and exposed the hacker's identity. Despite being unable to login into her Instagram account, Maine stayed calm and even assured her fans that she is alright. “Tulog na kayo [You may sleep now], I’m fine,” she tweeted. Her Instagram account, which has 2.2 million followers, remained private as of Thursday morning. However, its description now contains a message of apology from the hacker. "I will put your email so rest the password, I know I'm wrong, I'm sorry," it reads. In November 2015, Maine's Twitter account was hacked by Anonymous Philippines in order to promote the Million Mask March. It is possible that her passwords are easy to guess or clues to it can be found on her posts or profile details.